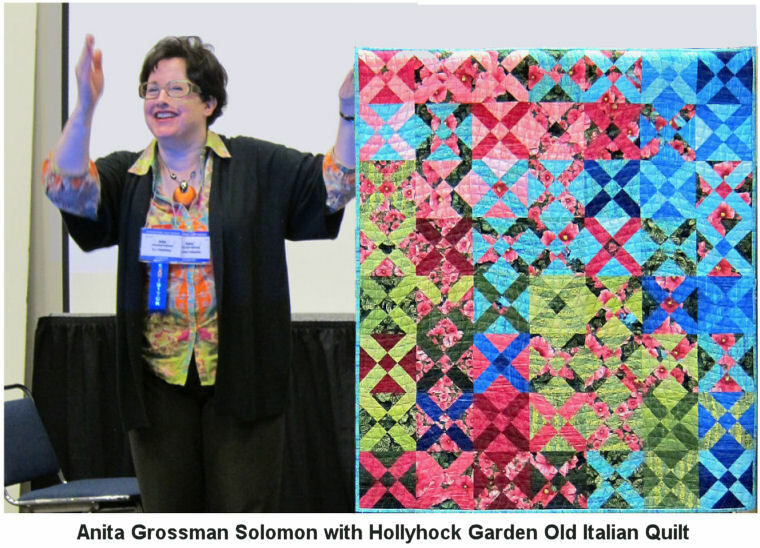 While in Houston for quilt Market & Festival recently, Anita Grossman Solomon (of Make it Simpler) and I met with Jackie Kunkel for a podcast interview. Please join us! Visit Jackie’s Quilting Chronicles for more great interviews! 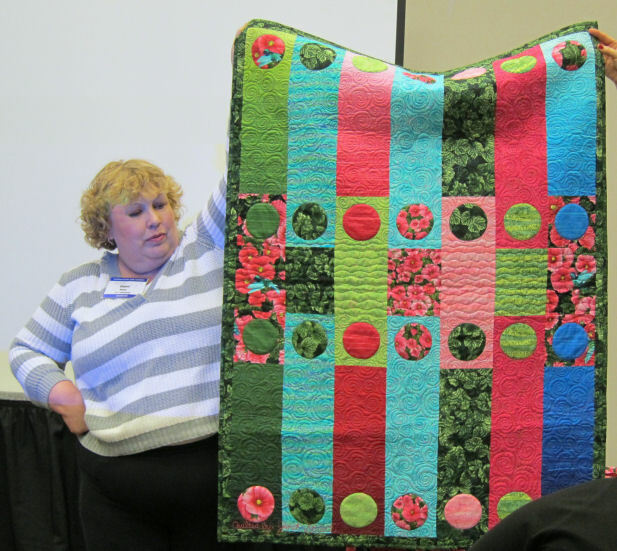 Here is a very cute design by Cherry House Quilts – I Do, Too. 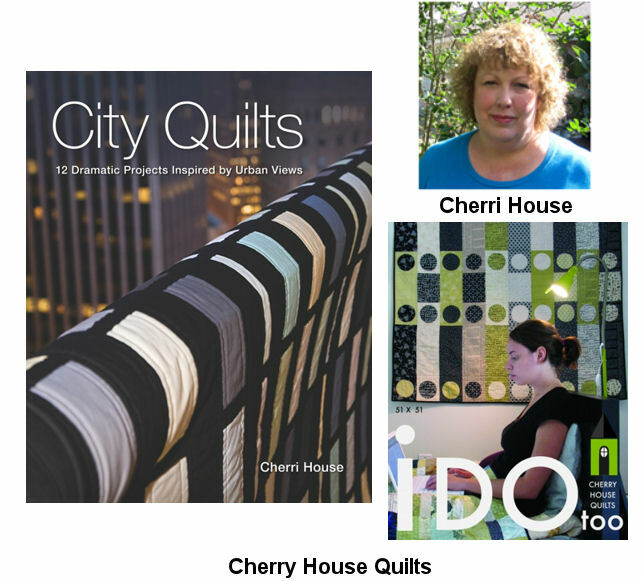 Designer Cherri House has created I Do in several sizes. 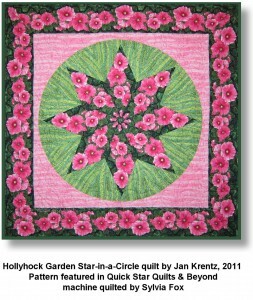 I laid out a smaller version, using nearly all pieces of the Hollyhock Garden collection. The circles were cut out, gathered over a stiff piece of freezer paper, and sprayed with starch. After pressing the edges, the paper form was removed, and I machine appliquéd the circles to the background squares. 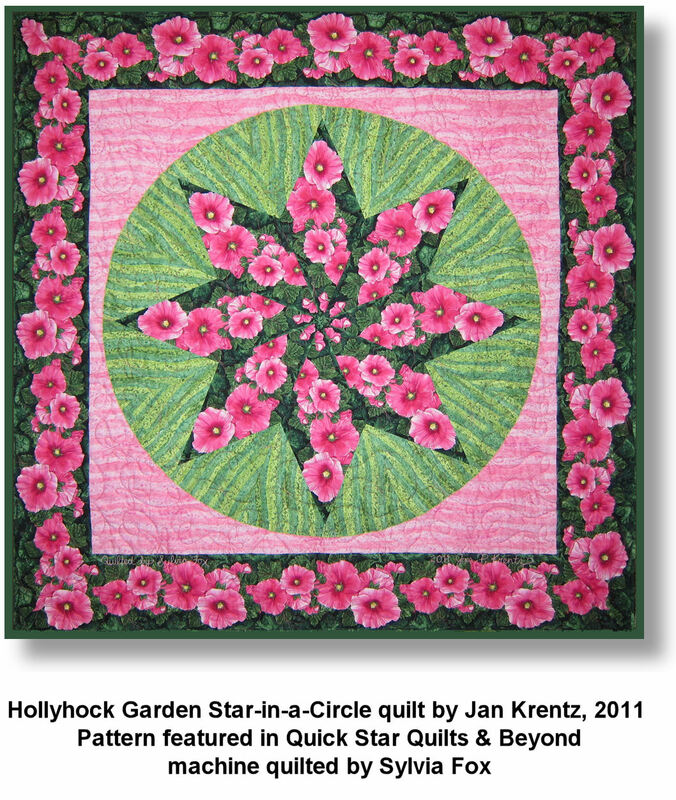 Contact Cherry House Quilts to purchase the pattern. Enjoy! Here is a great small quilt, the pattern is available in my book Quick Star Quilts & Beyond, featured in different fabrics in the book. To create this quilt, I first lay out the fabric, and place a diamond ruler over the printed motifs. 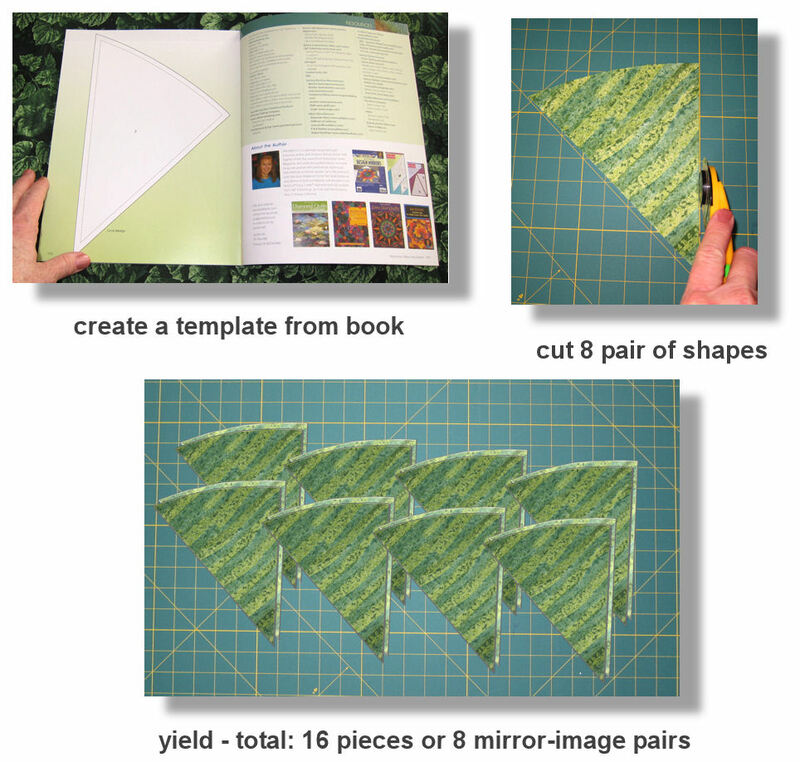 Position a hinged pair of Quilter’s Design Mirrors at one pointed tip to preview how 8 repeats would look. Remember, you are seeing a mirror image, so the finished design would not look exactly the same unless the fabric itself had mirror-image motifs. 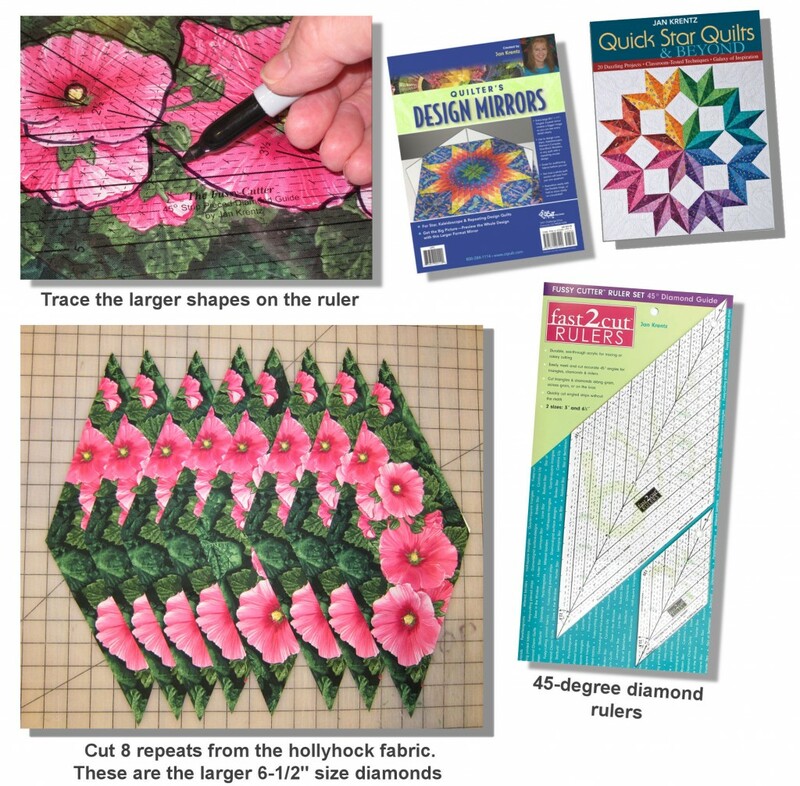 Once you decide which area you’ll cut from, trace the larger shapes (from the fabric) onto the surface of the Fussy Cutter 45-degree diamond ruler. You do NOT want to outline on the surface with the printed ink (the bottom). Draw on the smooth, unprinted surface (the top) using a permanent marker such as a Sharpie or Ident-i-pen. Rotary-cut 8 identical diamonds—repositioning the ruler each time, locating the next printed shape. Create a template using the pattern in the back of the Quick Star Quilts & Beyond book. Layer the fabric wrong sides together, and cut 8 pairs of background wedges through both layers. Note, when the pieces are separated, right side up, you should have 8 pieces angled one direction, and 8 identical mirror-image pieces angled the opposite direction. Assemble the star with the background wedges, as described in the book. Applique the large star with circular background wedges over a simple square with mitered borders from the companion fabrics of choice. 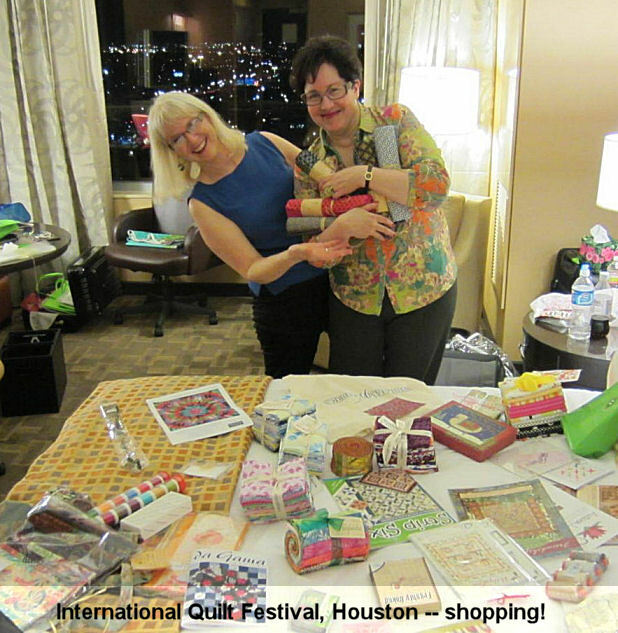 I was thinking of ideas for Market in a few weeks in Houston. What if the fabrics were used around the house – let’s say as kitchen or dinner table items? Aprons, table runner, placemats, napkins? 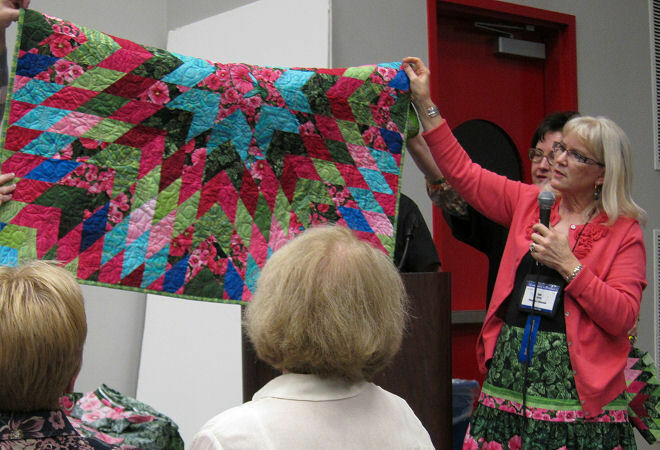 Use any pattern you have on hand, or patterns purchased at the local quilt shop. 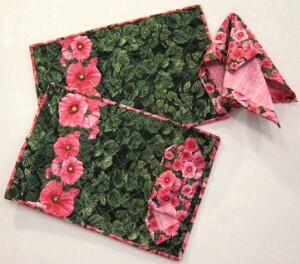 With the expertise of my friend, Betty Alofs, the fabrics are transformed! Betty made reversable napkins with a mitered border on one side – very classy. 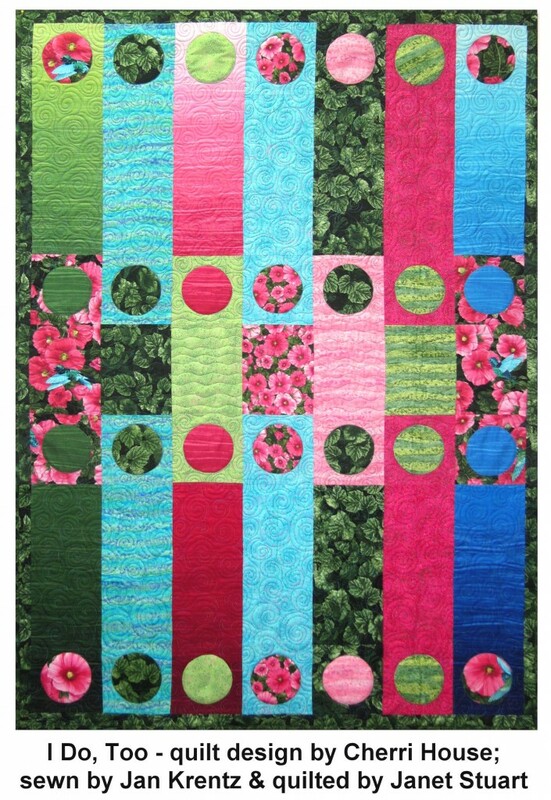 The table runner is a great pattern by Karen Montgomery of The Quilt Company, called “The Easy Striped Table Runner”. Comments, anyone?? New Fabric line! 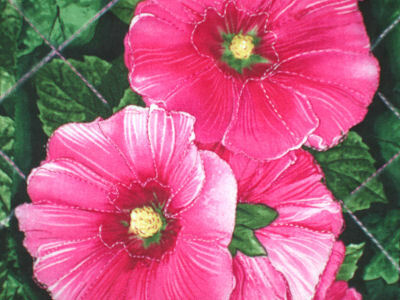 Hollyhock Garden! I am also working on some great designs that I’ll post in the coming days! Ask your local quilt shop to carry the collection. 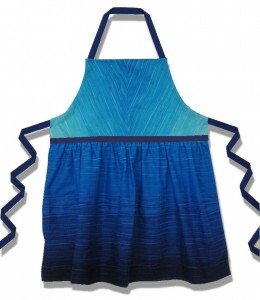 The colors are bright and cheery, with a range of pieces that will also blend into the stash you currently own. 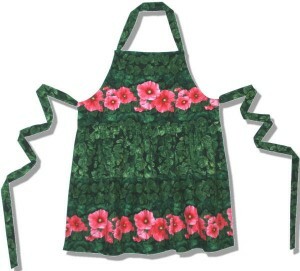 There are four floral / leaf prints: an all-over leaf in dark greens (suitable for background, or fussy-cutting the leaves for applique), a small-scale pink tossed Hollyhock flower print (great, bright color – the blossoms could also be used as petunias, or hybiscus if you embroidered their distinctive stamen). 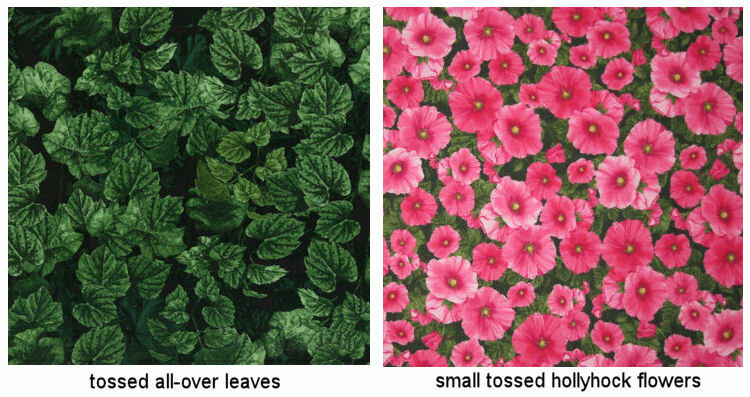 The leaf and flower sizes are about 1-1/2″ to 2″ in these prints. The second pair of prints are larger scale – about 1-1/2″ to 3-1/2″ in size. The large hollyhock print features teal blue hummingbirds here & there, and the matching border has 4 repeats, selvage to selvage. The images are so pretty! They are perfect for fussy-cutting as applique motifs, or cutting large chunks for easy piecing!